Big Y World Class Market wrote: "Hi Lindsay, we just wanted to let you know that we have decided to alter our "Must Purchase in Quantities of..." signs going forward. That text will be in ALL caps and will live right beneath the price. We just wanted to thank you again for bringing this to our attention and thought you'd like to know that because of your comments we are making some changes to better serve our customers." Many thanks to Big Y for listening to my thoughts and for taking action on signage. It's nice to know that Big Y is looking out for the consumer. To all my Big Y shoppers - I wanted to let you know about a pricing strategy that Big Y is now utilizing. Tonight after work I stopped by my local Big Y. While in a rush to get home I picked up a couple boxes of Lean Pockets, and assumed they were on sale 5 for $10 ( i.e. $2 a box). It's an unwritten rule at most grocery stores that when a price says 5 for $10, you don't actually have to buy five to get the sale price. 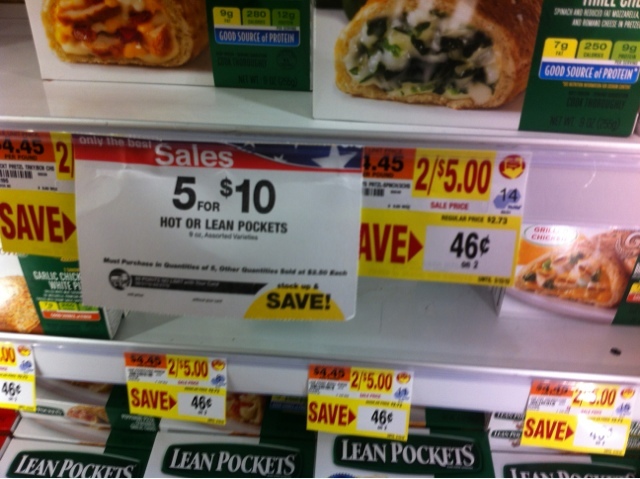 Now I've bought Hot/Lean Pockets here a hundred times during similar sales. So when I got in my car and looked at my receipt I was surprised they didn't ring up on sale. I checked in with the service desk and the customer service rep told me that the same thing had happened to someone else buying Healthy Choice. I went back over, looked at the sign and sure enough in tiny fine print it says 'must buy five'. I am disappointed in Big Y as I think this is a deceiving practice. Big Y shouldn't have to trick customers into making purchases. Had I known I would have had to buy five boxes - I would have bought these items at another local store who has Hot Pockets priced at $2 every week. So if you are a Big Y shopper - check the fine print! You might be surprised what you'll actually be paying. That was nice of them to make the change but still pretty dumb that you have to buy all 5 to get the discounted price. I would say "see ya!" and go to the store that I don't have to worry about if there is fine print or not.